The term “sportbike” typically evokes a very specialized type of motorcycle with low bars, high pegs, and a fairing to make the mechanical parts slip easily through the air: going fast, we’ve learned, requires that a bike fit into a very narrow set of parameters, and a machine optimized to go fast doesn’t do much else very well. But it wasn’t always so, and the definition of what a sportbike was less specific in days gone by. 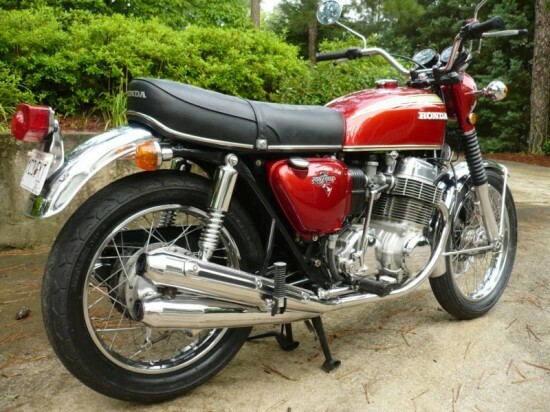 To modern eyes, a Honda CB750 is a very un-sportbike-y machine: handlebars, no fairing, twin shock rear suspension, and that most generic of powerplants, an inline four. But to riders in the late 60’s and early 70’s it was a revelation in speed, and spelled the demise of the moribund British and Italian motorcycle industries, formerly the standard bearers of sporting motorcycles. The new Honda boasted twice the cylinder count of most competing machines, five forward speeds when many at the time had only four, and was reliable enough to run all day without breaking a sweat. The specs are so ordinary today, simply because everyone else had to copy the formula to compete. Looking for bikes for this site, I’m especially drawn to ads that feature comprehensive photographs and detailed, knowledgeable descriptions. I’m not a huge fan of Hondas, but this one caught my eye and is worth a second look. 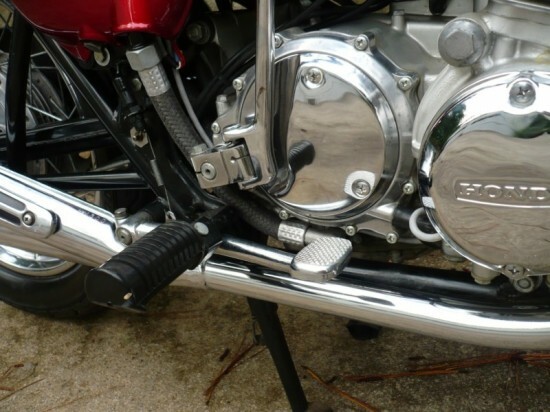 New rear shocks (reproduction units from Classic Motorcycle Supplies). New Dyna Ignition (including coils and wires) – no more points, weak coils, or 40 year old plug wires! Starts much easier and runs better with electronic ignition. 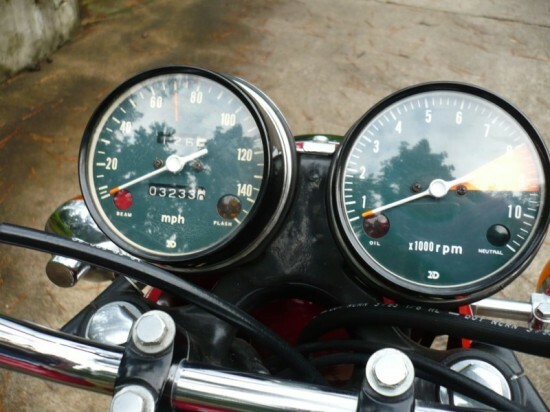 I have put less than 200 miles on the motorcycle since instaling those parts. It runs great, rides great, sounds great – you have to love those HM300 pipes. It does not smoke, and makes no unusual noises. The chrome is in very, very good shape with no rust. There are no dents or rust on the exhaust. There are no dents in the bodywork. The engine is original to the frame. The engine cases are not cracked or broken (common problem with these early CB750’s due to chains breaking). I have a clear title in my name. I did not perform the restoration. The previous owner indicated he bought the bike from a shop in Texas, and someone from the shop performed the restoration. They did a good job, all the parts are correct. They painted the bodywork and the frame and the paint is very good. 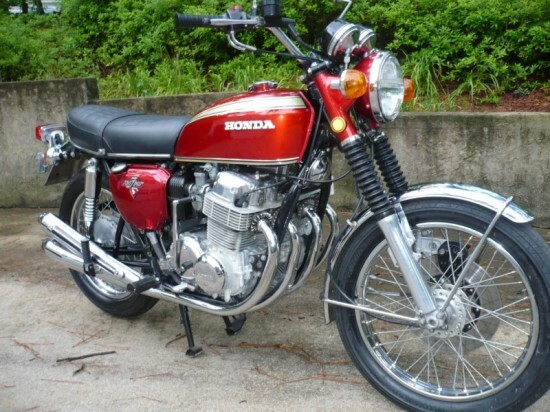 It appears they put a new Honda HM300 exhaust system on it based on the condition (no rust, no holes, no dents). The seat is a nice reproduction. The chain is a nice new heavy duty one. Is the bike perfect, museum quality? No. The rubber gaskets that hold the mirrors in place are old and have shrunk, so the rattle. There are two tiny chips in the paint near the rear of the gas tank. The left side cover ws cracked when I bought it; I repaired if from the inside. You can see the two cracks if you get very close. The rear brake shoes squeek a little. The clutch has a very narrow engagement point. The clutch plates should be take out and cleaned, but I do not have any problem riding the bike, so I have not bothered. Bidding is up to $5,200 with the reserve not yet met. I’m not sure what the seller is looking for here, but the bike looks like a very nice rider and, assuming the reserve is reasonable, would make a more cost-effective proposition than restoring a rat’s nest barn-find yourself. 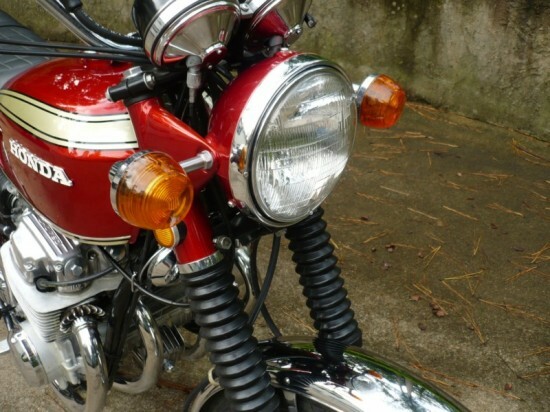 1979 Honda CBX Turbo for Sale? !